Under the “Participatory Irrigation Management Capacity Building Program” civil work component, BRD supported the Irrigation Associations (IAs) and Community Development Councils (CDCs) of Ningarhar and Balkh in prioritization, selection and designing of the irrigation infrastructure projects, including the process for approval by the Ministry of Agriculture, Irrigation and livestock (MAIL) under the Asian Development Bank (ADB) grant , where 22 contracts with the total value of $ 3, 55000 USD have been awarded to CDCs and IAs in Ningarhar Valley Development and Lower Balkh Sub- Basin for improving the irrigation infrastructure in their respective canals, to better manage irrigation water and increase irrigated land to contribute toward increasing crops productions in the irrigated farmland. 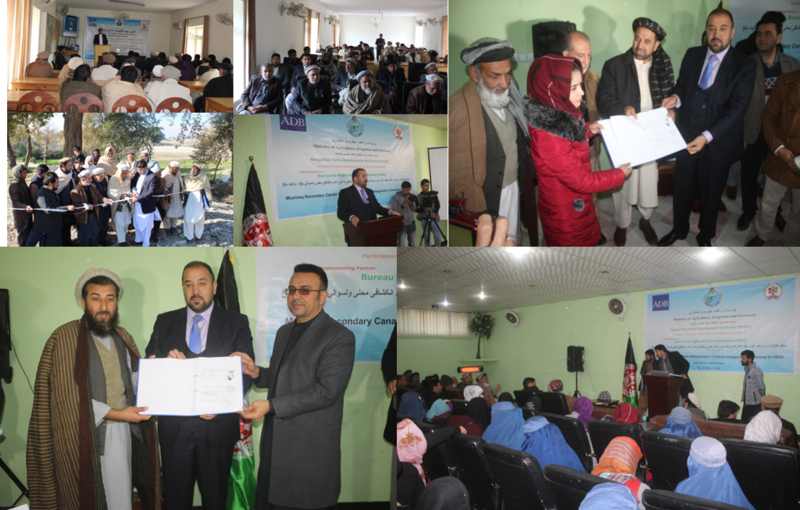 The Contract signing ceremonies organized by BRD, inn Balkh and Ningahar provinces, in which senior officials from ministry of agriculture, provincial government official, district governors, CDCs and IAs members, members of international organizations working in the agriculture sector including media attended the ceremonies. The officials from the ministry of agriculture and IAs and CDCs have appreciated BRD efforts for successful implmentation of all the elements of the civil work component which resulted, approval of the grants for 40 projects to the targeted CDCS and IAs from which the grant contract for 22 projects have been signed and the remining contracts will be signed in the second stage. The Participatory Irrigation Management Capacity Building Program is funded by the Ministry of Agriculuture&Irrigation and Livestock (MAIL) under the grant support from the Asian Development Bank (ADB), implemented by the Bureau for Rights Based Development in Ningarhar and Balkh Provinces.